In a video testimonial, SaBella LaValle tells how she used alternative medicine techniques taught at Dr. and Master Zhi Gang Sha’s Source Song & Source Dance Soul Healer Certification Retreat to dramatically improve her singing voice. New video testimony reveals SaBella LaValle’s personal story about how she used the Soul Healing Miracle techniques taught at Dr. and Master Zhi Gang Sha’s Source Song & Source Dance Soul Healer Certification Retreat to dramatically improve her singing voice. After hearing about the Retreat from a visit to a MeetUp Group in Oregon for Soul Healing where participants chant and sing, SaBella says, “I always wanted to sing for God. I knew that this place was for me.” SaBella wanted to meet Dr. and Master Sha so she attended the Source Song & Source Dance Soul Healer Certification Retreat and received a multitude of blessings for her singing voice and learned soul healing techniques to improve her vocals. “When I sing for people, they always remark about how I’ve touched their hearts,” SaBella says about her performing experiences prior to the retreat. After earning her Source Song & Source Dance Soul Healer certification, SaBella says on video, “I’ve never touched their souls with my voice till now. This is my chance to sing for God.” Watch SaBella’s dramatic vocal improvement and personal testimony about her experiences with Dr. and Master Zhi Gang Sha during a recent Soul Healer Certification Retreat in Toronto: http://youtu.be/aCGtitLIxag. Millions of people are searching for wisdom, guidance and practical techniques to aid in the advancement of their spiritual journey. The #1 New York Times bestselling author, soul leader and a grandmaster of many ancient Chinese disciplines and the founder of Soul Mind Body Medicine® and the Institute of Soul Healing and Enlightenment™, Dr. and Master Zhi Gang Sha opens a path to harmony and transformation of every aspect of people’s lives. In a rare opportunity, Dr. and Master Sha led seven days of extraordinary healing and transformation through Source Song. He shared powerful techniques so that people can advance on their physical and spiritual journeys. 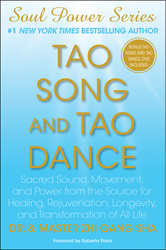 Being a direct channel of the Source, Dr. Sha focused on teaching individuals to develop their Soul Song Channel by connecting with the frequency of the Divine and Tao to remove soul, mind and body blockages. Soul Song is soul-guided singing. Soul Dance is soul-guided dancing. To learn more about the Source Song & Source Dance Soul Healer Certification Retreat and how individuals learned to develop the healing qualities of their voice and dance movements, watch this video featuring Dr. and Master Sha: https://www.youtube.com/watch?v=5GOjkjcdhEM. Tao Song is the sound from the heart and soul of the Source. Each person has their own unique Soul Song, which is the song of their soul. When a person is able to access the power of their soul, they can heal, rejuvenate, enlighten and transform any aspect of their life, including their health, relationships, finances, and even intelligence. During the Source Song & Source Dance Soul Healer Certification Retreat, Dr. and Master Sha helped individuals to bring out their Soul Song and develop their own Soul Song Channel to connect with the frequency of the Divine and Tao, plus he taught ancient secrets and practical techniques to transform the participants’ voices. Soul Song bypasses the logical mind and carries a higher frequency and vibration than normal singing. When individuals open their Soul Song Channel, they connect with frequencies that can profoundly affect individuals’ bodies, minds and spirits. Dr. and Master Zhi Gang Sha is the world-renowned miracle soul healer. He has created thousands of soul healing miracles worldwide in the last ten years (http://www.youtube.com/zhigangsha). He is the founder of Soul Mind Body Medicine®. He was trained as a conventional medical doctor in China and a doctor of traditional Chinese medicine in China and Canada. The founder of the Institute of Soul Healing and Enlightenment™ and the Love Peace Harmony Movement™, Dr. and Master Sha is a grandmaster of many ancient disciplines, including tai chi, qigong, feng shui, and the I Ching. Dr. and Master Sha is also an expert in the most advanced cellular healing science now occurring in China. In the West, he is involved in breakthrough research on the effects of spirit on the human system. Dr. Sha was named Qigong Master of the Year at the Fifth World Congress on Qigong. In 2006, he was honored with the prestigious Martin Luther King, Jr. Commemorative Commission Award for his humanitarian efforts. Dr. and Master Sha is author of more than 10 books in the Soul Power Series published by Simon & Schuster (Atria Imprint), with each book reaching the New York Times bestselling list and four of them reaching #1. Dr. and Master Sha’s new series, Soul Healing Miracles is published by BenBella with the first book entitled Soul Healing Miracles: Ancient and New Sacred Wisdom, Knowledge and Practical Techniques for Healing the Spiritual, Mental, Emotional and Physical Bodies. Released in November 2013, it was an instant national bestseller landing on the USA Today, Wall Street Journal and Amazon bestseller lists within days of publication. Visit Dr. and Master Sha on his website http://www.DrSha.com and http://www.facebook.com/DrandMasterSha to receive free daily Soul Healing blessings via webcasts, teleconferences, app, 24/7 Chanting Channel, and in-person at events held throughout the world.